Bullying is an age-old problem that has plagued countless kids and ruined what could otherwise be a transformational school experience for them, replacing the love of learning with fear of humiliation. Though tactics may not have changed, the tools have, and technology is the most current smoking gun. But parents and kids are not powerless. As much as technology can be used as a weapon, it can also be used as a powerful resource of information, garnering support among peers, and putting an end to where the bad behavior begins. 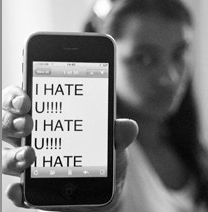 Nearly one-third of teens have been targets of cyber-bullying, according to a study released today by the Chicago youth-market research firm TRU, and in the wake of Tyler Clementi's suicide, the statistic takes on that much more relevance. Though there's valid reason to be alarmed, a great article by the Christian Science Monitor's Stacy Teicher Khadaroo about the subject gives us some much-needed context about what's already being done now and what parents can do to help: namely, empower kids to set boundaries and stop malicious actions before they escalate. When it comes to safety online, young people’s main “knowledge gap” relates to “setting ground rules of what’s acceptable behavior ... and how that technology may be used against them ... where they could be blackmailed or cyberbullied,” says Richard Harrison, lead mentor for the Safe and Secure Online program, which enlists online security experts to volunteer in schools. Grabbing teens' attention right where it naturally lives, MTV's website A Thin Line asks: "Do you have digital drama?" 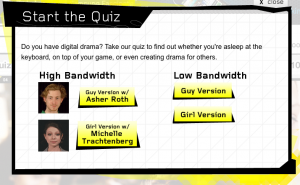 The guides to the answers are provided by teen celebs: rapper Asher Roth representing boys or actress Michelle Trachtenberg representing girls. Questions vary from how they feel about incessant instant messages from boyfriends/girlfriends ("It's proof of how much he loves you" or "It's like you're being stalked"); how to deal with someone who's making accusations and insults online ("Defriend them, block them, notify online service provider, tell a parent, teacher or authorities you're being harassed online"); to how to respond to salacious photos ("delete," "keep" or "forward"). The blurry line between harassment and attention is further explored by juxtaposing ideas: insult/injury; him/the whole school; love/abuse; this moment/forever; curious/controlling; words/wounds. Tapping into youths' facility of sharing information, the site invites users to discuss tricky situations they've encountered, and how they reacted. MTV also launched its "Love is Louder" campaign soliciting videos that show examples of love and support. Teicher Khadaroo also points out that both TV personalities Dr. Phil and Anderson Cooper have dedicated entire shows to the subject. And as part of its public information effort during October's National Cyber Security Awareness Month, organizations like Stay Safe Online provide a comprehensive list of actions parents and consumers can take. With so much attention from media and celebrities spotlighting the problem, what I'd love to see next year is a study that shows cyber-bullying incidents dropping. Now that would be newsworthy.